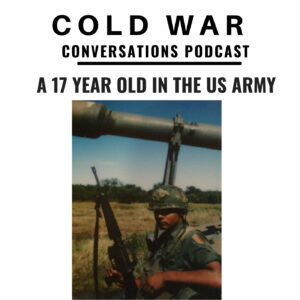 Today we speak to Manuel Alzaga who as a 17 year old joined the US Army in 1981. Manuel signed up to the artillery and tells his story from life of poverty in Los Angeles through to deployment in West Germany for a Reforger exercise. Before we get going you can really help us get more listeners by leaving reviews on Itunes or with your favourite podcast provider. This really helps raise our profile and get guests on the show. If you’d like to support us with a few dollars, pounds or roubles then click here to learn more. Thank you so much to all our fans that are supporting us – it is really appreciated! Now back to today’s episode. We start by talking about Manuel’s early life. !